I love how you included the animals in the background for Elsa. I would love to see a penguin for Frozen 2. Okay I love Elsa, but even Elsa aside, this is literally one of the most gorgeous pieces of art I have ever seen. I love snowy owls and. Wolves but the orca is what sells it. The design and proportions are so charming and exquisite, I'm simply in love, I just want to stare at it all day!!! This is just magnificent! I love the shades of blue you used! I don't like Frozen, but this is amaziinngg! U SHOULD DO THE FROZEN TRIO. I like the orca the most. I'm so in love with that great idea. This is amazing! And Elsa's being followed by my 3 top fav anmals! 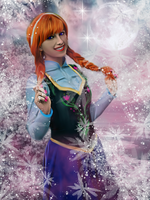 I love Frozen and you art! Frozen definitely needed more whales. Nice work! that is truly stunning, I love it! This is such an awesome image. We at and would love to host this. How did I go a WHOLE YEAR without finding THIS ? My three favorite animals of earth, sea and sky! I've been looking for this picture for like forever! It's beautiful.